Ever since the lovely ladies at Skirt Sports and Sweat Pink reached out to me about running the Skirt Sports 13er (yes, I got the entry and gift certificate for free, but all the opinions here are my own), I intended to treat it as a training run. I knew that a month and a half after my last marathon, I’d be coming into the race with little to no speedwork. I also knew that I’d spend the week prior to the race running trails, which would leave my flatlander legs tired. So I really had no goals for this race, other than to have a good time. Spoiler alert: That’s exactly what happened! The race started at 6:30 a.m. Yes, that’s early… but it’s Colorado in June on a course with no shade, so really, the early start time was fantastic. Jordan and I had stayed in Estes Park with his family the night before, so we were on the road by 4:30 and at the start at about a quarter to six. 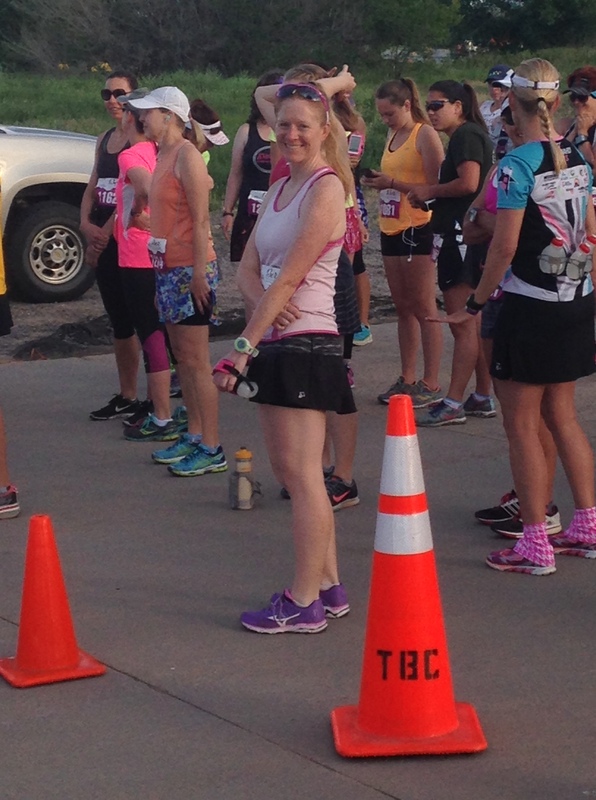 I picked up my bib and goodie bag with no trouble, did a warm-up mile, and hit the porta-potties (of which there were plenty, thank goodness… at a race this female-filled, we need a lot of them!). The race started on the other side of an overpass from the expo/finish line. I guess that last year, racers had to run over the bridge, which caused bottlenecking, so the organizers moved the start line this year. As we headed up the bridge, Skirt Sports founder Nicole DeBoom (who is pretty much my hero) gave us all high-fives. We received a few instructions and some encouragement at the start line, and soon we were off! Because I’m a chump, I got caught up in the start-line energy and set off WAY too fast for a training run. And then, at my too-fast pace, I fell in with a couple of super cool women, and we started chatting, and so I continued at that too-fast pace for a few miles. Whoops. By the time we hit a steep-ish hill at around mile 4, I caught my error and made myself slow down. I was not in race shape; I should not be racing. We had views of those mountains, plus cattle pastures and open spaces, pretty much the whole race. At mile 7ish, the race heads up a massive hill (nicknamed “The Bad Relationship” — ha!). Confession: I walked a bit. I was being a baby and really had no reason to walk, but… I did. Then, the course turns into an open space for a little out-and-back. Races with those little out-and-backs bug me for some reason, but it wasn’t long. From the open space on, the race is either flat or downhill, which was nice. I did run out of water in my handheld (totally my fault for not refilling it at the last aid station), and because it was getting warm, I started to get a little lightheaded and chose to walk again. Had I been racing, I probably would’ve just pushed through, as the next aid station was near, but again: being a baby. The last couple of miles were uneventful but HOT: I was really glad the race started so early. I crossed the finish in 1:46:something — my slowest half ever. And this is why I usually don’t do races as training runs: I was mad at myself. That’s dumb, and I know it, but sometimes my emotions get the best of me for a bit. The mad didn’t last long; I reminded myself that it was a training run, and that I had intended for it to be all along. I drank some chocolate milk and all was right with the world again. Here’s a list of key points about this race. I was going to break it into pros and cons, but some things are subjective, so it’s all one big list. You can decide if you want to run it without me classifying things for you. Girl-power vibe. The racers are almost all women, and everything from the pep talk at the start to the finisher skirts to the kick-start program participants was women-centered and focused on making us all feel like badasses. I loved it. 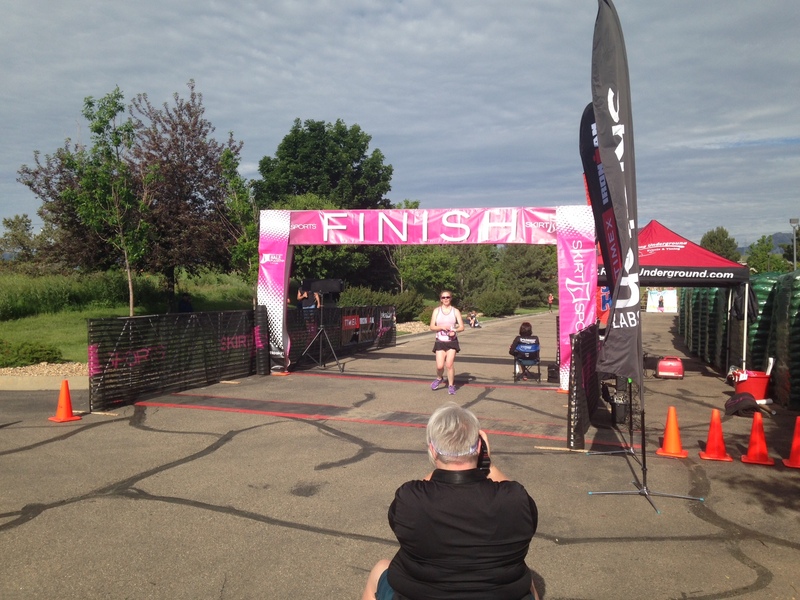 Plus, it’s always fun to see women as the overall winners, since that doesn’t happen in most races. Awesome little expo. There was gluten-free cake (I heard it was amazing, but I was all hot and no food sounded good), EVOL burritos, chips, salsa, fruit, Two Moms in the Raw granola, kombucha, chocolate milk, Skratch … all sorts of tasty business. Plus, since Home Depot was a race sponsor (and the start and finish lines are in their parking lot), they had a booth set up where kids could make crafts while their moms ran. They also had a DIY race bib display project. I did not make one, because I don’t do crafts, but it’s cool for those that are crafty. Finisher skirt. And bucket. I have about 12 million race t-shirts, so I LOVED getting a cute little skirt. I also was pretty excited about the free Home Depot bucket, because with all the yard work we’re doing, we needed another one. Hot, and no shade. It’s June, so of course it’s going to be hot. If you run this, be prepared. I was wishing I’d worn a hat and carried my bigger handheld. Great aid station support. Carrying the small handheld wasn’t a big deal, because there were plenty of aid stations, and all the volunteers were super friendly and encouraging. Well-marked and well-staffed. If you get lost on this course, you’ve got issues. Bonus: Every mile-marker/directional sign had an “I run for…” poster, each with a different picture under the “I run for…” headline. Everything from margaritas to shirtless firemen was featured. The signs were funny and provided nice little pick-me-ups along the course. Not many spectators. Aside from the aid stations, I saw only 3-4 groups of spectators along the course. That’s fine with me, but if you’re big on crowd support, you might have to recruit some friends to cheer along the course. Beautiful and challenging course. This course is at the base of the foothills, so if you’re a flatlander like me, train for the hills — there are several, and that “Bad Relationship” is serious business. I thought this was a great little race, and I’m planning to be back next year — racing it this time! I’m grateful to Skirt Sports and Sweat Pink for the opportunity. If you have a chance to do a Skirt Sports event, do it (even if you’re a dude)! Can you do races as training runs, or do you get frustrated like I do? What’s your favorite half marathon? Previous PostA Few Days in My Happy Place: The MountainsNext PostHappy 2nd Birthday, Blog! I read your recap today. I am such a baby when it’s hot! Wow! I’m blown away that that is your slowest time. That is a time I never have a prayer of reaching 🙂 I totally understand the disappointment and anger at yourself though. I do the same thing. No matter how much I tell myself that I’m not going into a race with any time goals, I inevitably still try to “race” it. I hope it didn’t last long for you though because that is seriously still something to be really proud of!